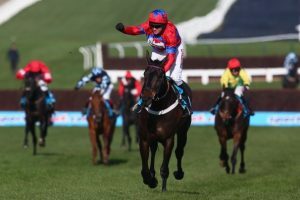 Another race with royal flair, the Queen Mother Champion Chase is a 1 mile 7 furlong National Hunt Steeplechase race held at Cheltenham racecourse each year. The race takes place on the old course as part of the much anticipated Cheltenham Festival. It’s run on the second day of the festival. With twelve fences to clear and a competitive atmosphere to add into the mix, for many this is a real highlight of the four day event. Inaugurated in 1959, the races name changed from the National Hunt Two-Mile Champion Chase to the Queen Mother Champion Chase due to the Queen Mother’s 80th birthday celebrations. I’m sure nobody begrudges this change as it always was a joy to see the Queen Mother’s love of both life and horse racing throughout her golden years. She was not only a keen racing fan, but also an owner, coming close to winning this very event with Game Spirit in 1976. The most successful horse in the history of the Queen Mother Champion Chase is the beloved Badsworth Boy with three wins in a row in the 1980’s. Leading jockey honours are split between 60’s sensation Pat Taafe (winning with horses in 1960, 1961, 1964, 1966 and another for good measure in 1970!) and Barry Geraghty, who has shone brightly in more recent years. A highlight in recent history has to be the back to back wins by Paul Nicholl’s trained Masterminded, who won the Queen Mother Champion Chase in both 2008 and 2009. The 2018 winner was Nicky Henderson’s Altior. The Irish bred 8 year old and bookies favourite won by seven lengths and in impressive fashion.